Popular woodcarving includes works to do with the needs of the home (carved wooden panelling, furmiture, utensils), church (screens, pulpits, icon stands, candelabra, lecterns, bishops' thrones) and professional life (ships' figureheads, shepherds' crooks). The most commonly used woods are walnut, beech, white wood (poplar, birch), cypress, mulberry, box, cedar and wild olive. 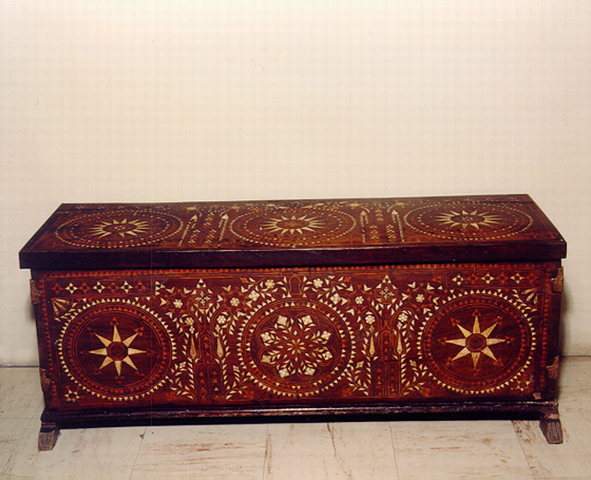 The decoration is incised, relief and painted, and there are often inlaid motifs of mother-of-pearl, ivory and silver. There used to be famous woodcarving centres in Northwest Greece, at Pelion, on Skyros and in Crete.